Maya Angelou, one of our nation's best writers and thinkers, died this morning at the age of 86. Maybe you read I Know Why the Caged Bird Sings in college. Maybe you heard Oprah talk about her all these years. Or maybe you caught a glimpse of her on Sesame Street or some interview. No matter how you first encountered her, you probably felt honored to hear her words and glad that she was in this world. 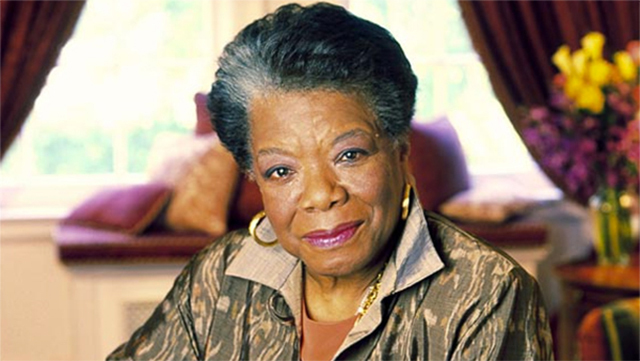 Angelou famously wrote, “I’ve learned that people will forget what you said, people will forget what you did, but people will never forget how you made them feel.” We might forget the poems of hers we memorized, or that she was San Francisco's first African American female street car conductor, or the exact words she spoke to Tupac on the set of Poetic Justice, but we'll always remember how she made us feel understood, instructed, mothered, and free. Her inauguration poem for Bill Clinton named so many types of people, as if to say I see you, you are valid. Maya Angelou appeared on a show called Iconoclasts, which pairs unlikely artists together and documents what happens. Her match: Dave Chappelle. You really should watch the whole episode. Epiphanies! Tears! The works! We have Oprah because Oprah had Maya. Hear her speak about being mentored by such a titan. Angelou's sway was so powerful, she even made Tupac cry. Watch her maternal spirit come alive in this Sesame Street clip. And here's the best advice the best advice-giver had ever received. If 6 moments weren't enough of Maya's spirit, here's one more for good luck.